Ivelia, an indigenous Makushi who has been surveying animals and plants in the tropical forests of Guyana for weeks for some Stanford scientists, walks back to her village near the river Essequibo, in the high part. She senses what this data might be useful for. Neil, a taxi driver in Mobile, Alabama, worryingly looks out of the car window at the sooty black painted sky of the city. He senses it too. Naja, a Danish girl who lives in Aalborg with her family, learned about natural selection at school for the first time. She smiles understanding that this knowledge was already part of her. She senses it. Yukio, a young engineering student, sits in his room in a village near Kofu in the center of Japan. He listens to his grandma murmur that everything varies in a unique way. They sense it. Luca and Enrico, two firefighters battling a terrible fire in the forests of Basilicata, in Southern Italy, listen to the terrifying sounds of animals escaping or dying. They sense it too. Paulina, a 19-year-old, has just given birth to her first daughter in a ramshackle hospital in Nacala, Mozambique. Dry eyes and mouth, she squeezes the little one against her chest and hopes fervently that the baby’s life will be better than hers. They both sense it. Back in Spain, I was trained by my mentors, A.R. Larrinaga and J. Guitián, as an animal-plant interaction ecologist: thus, when I observe nature or data I think of interactions. I met Joe Fragoso and Kirsten Silvius during the amazing years I spent at the Dirzo lab at Stanford University. Joe and Kirsten presented the incredible data they had been collecting in Guyana with the collaboration of dozens of scientists and hundreds of indigenous people. While brainstorming with Joe, during a happy hour at the biology department, we thought that if plants had a role on the carbon cycle so could the mammals that interact with them. This research is important because it corroborates an obvious idea. Every species has a role in nature, therefore losing species declines natural processes, and this should include mammals and the carbon cycle. 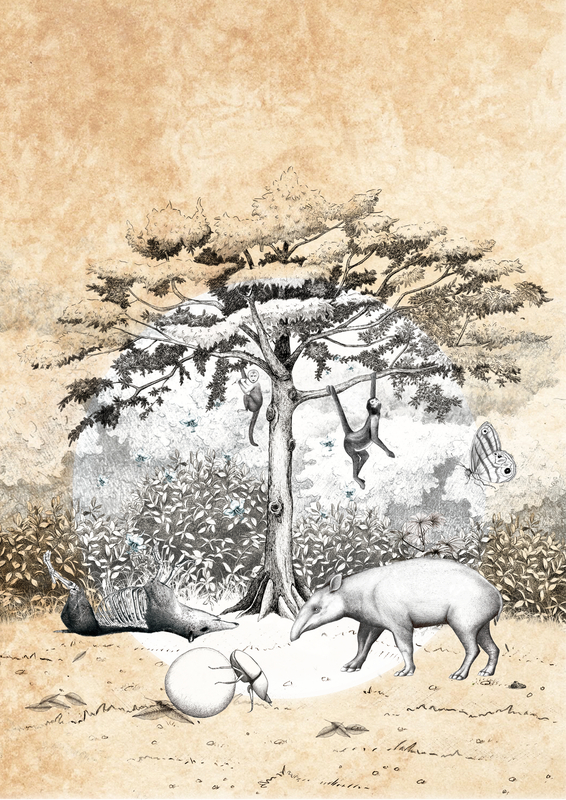 As obvious as it sounds, and even though it has already been accepted for the vegetal world, it is a very difficult idea to test regarding vertebrates in a real-world system such as the Amazon. The amount of data needed to test such an idea is massive; it required the participation of hundreds of indigenous people from Guyana. Regardless of the practical use of this information, it is just wonderful to understand the world we live in and the nature with which we have evolved. But, from this work, there is also very useful information that come across; humanity needs to protect other mammals and defend cultural diversity. Indigenous people’s knowledge of their natural systems was necessary to say that protecting mammal diversity will clean up the sky; although it won’t be enough. 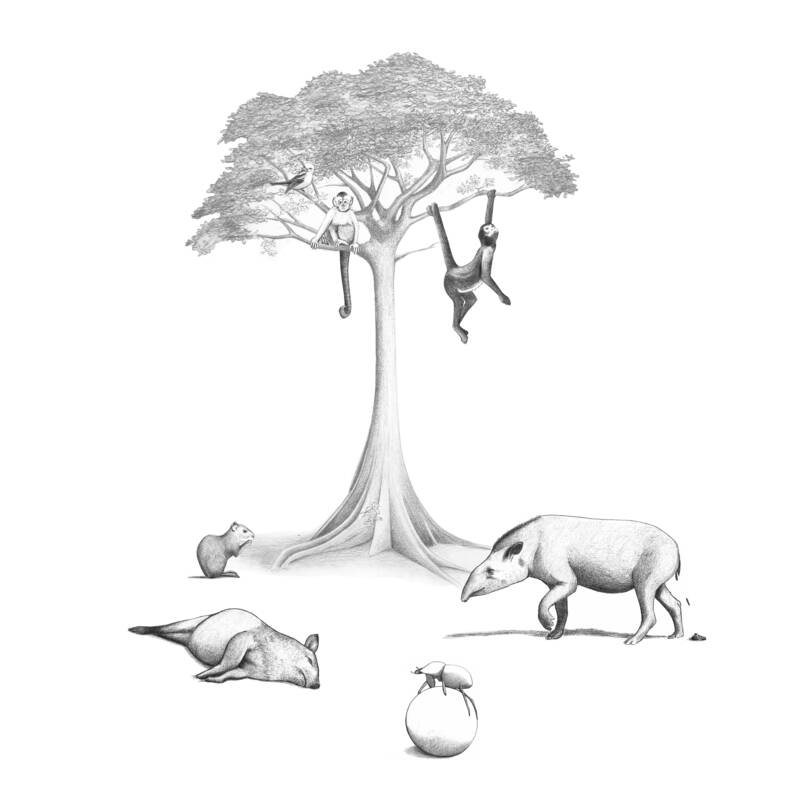 Watch our movie: Mammal diversity influences the carbon cycle through trophic interactions in the Amazon from Divulgare on Vimeo. Thanks to L. Gillespie for revision, S. García for the illustrations and P. L. Salgado for poetry.